Cite page (MLA): Ward, Megan, and Adrian S. Wisnicki. "Field Diary VI: An Overview." In Livingstone's Final Manuscripts (1865-1873). Megan Ward and Adrian S. Wisnicki, dirs. Livingstone Online. Adrian S. Wisnicki and Megan Ward, dirs. University of Maryland Libraries, 2018. Web. http://livingstoneonline.org/uuid/node/4307d45b-1155-4f12-8e35-00ab82d63fb3. This page introduces Field Diary VI, which is part of our critical edition of Livingstone's final manuscripts (1865-73). The essay overviews Livingstone's regular diary entries – primarily about an ongoing local African conflict – as well as his notes and drawings of African daily life. The essay also explores Livingstone's composition practices. In Field Diary VI, Livingstone travels through the Zalamyama Mountains and then across the Loangwa River valley. Throughout, he records the threat of violence from the Mazitu people, an African ethnic group descended from the Nguni of kwaZulu-Natal who migrated north due to the Mfecane of the early nineteenth century. The diary opens with two large villages in flight from the Mazitu. Later, Livingstone notes that this threat has hampered others' prosperity, that the "country in a poor state for the Mazitu have no check & come every now & then & strip people of all their food" (Livingstone 1866e:). This threat causes Livingstone to change his route, as he cannot travel through the famine-stricken regions. 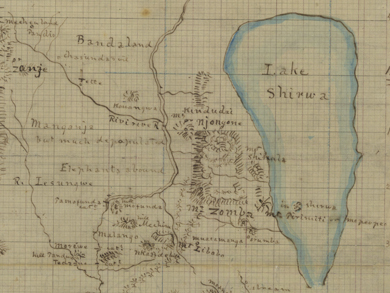 Later, he finds hidden food stores, unmarked to protect them from Mazitu raids, in the forests by the Loangwa river (Livingstone 1866e:). Two images of pages of Field Diary VI (Livingstone 1866e:, ). Copyright David Livingstone Centre. Creative Commons Attribution-NonCommercial 3.0 Unported. Both pages demonstrate Livingstone's interest in local African customs of dress and personal decoration. The picture at right (bottom in mobile) also shows an unusual turn to a more artistic rendering through Livingstone's complementary use of two different colored pencils. As in many of the previous diaries, Livingstone continues to comment on local customs of dress and personal decoration and includes many drawings of facial features and tattoos. As he travels, Livingstone finds numerous thriving iron forges. He also makes observations on the local means of communication, such the meanings of various hand-claps. The people of the region proves extremely hospitable. One promises to "see that he [Livingstone] has carriers quite early tomorrow morning who will hand him safely into Kanyindula's care & say to Kanyindula that he is expected to perform all the duties to a stranger" (Livingstone 1866e:). More than in previous diaries, Livingstone develops comparisons between Africa and Scotland, arguing, for instance, that "These people are not like our dangerous classes who borrow from civilization little but the art of masking evil & of converting knowledge into cunning" (Livingstone 1866e:). Livingstone also includes a lengthy discourse on the history of Scotland, presumably in comparison to Africa, as a land that was kept in the "rearward of civilization" by fighting until the twelfth or thirteenth centuries (1866e:). But, he concludes, by becoming "the apt pupil of more fortunate nations," Scotland grew in scholarship and industry (1866e:). Two images of pages of Field Diary VI (Livingstone 1866e:, ). Copyright David Livingstone Centre. Creative Commons Attribution-NonCommercial 3.0 Unported. Both pages contain calculations, while the presence of different colors of graphite suggests that Livingstone returned to these pages after some time away in order to revise them. During this portion of journey Livingstone rarely encounters slaves or slave traders, although he continues to ruminate on the slave trade. He notes that certain groups of Africans - the Zulus and Kaffirs - have no "idea of property in man that can be sold," but that Arabs do and so do the Manganja and Waiyau, groups whose links to slavery he discussed in previous diaries (Livingstone 1866e:). In addition, Livingstone argues that these different values may also translate to political and cultural differences: "All the 'heavy hung' Africans are slave dealers or vendors - the more moderate not" (Livingstone 1866e:). Additionally, Livingstone's interactions with Africans often grow out of the effects of the slave trade, as when he notes that two "smart young Waiyau men" joined his party. The employment of these men shows the mutable nature of "slave" and "free" status as they exist in central Africa: "[The Waiyau men] were bought at Mbanga & Mukate's by Babisa but the Mazitu killed all their Manganja masters & now they are free so we engage them" (Livingstone 1866e:). An image of two pages of Field Diary VI (Livingstone 1866e:-). Copyright David Livingstone Centre. Creative Commons Attribution-NonCommercial 3.0 Unported. This two-page spread contains the remnants of two or more plants that have been pressed onto the pages. As in previous diaries, Livingstone writes this diary from the front (daily diary entries) and back (random notes) at the same time, writing upside-down at the back of the book to differentiate the two types of writing. He writes primarily in grey pencil, with some additions in reddish-orange pencil and the occasional over-inking in black ink. The final section is used for maps of the mountain ranges and rivers he travels through, as well as temperature and distance calculations, and lists of local place names. This notebook also preserves more plant life than previous volumes with many pages bearing the imprints of flowers, twigs, and other such plant matter.